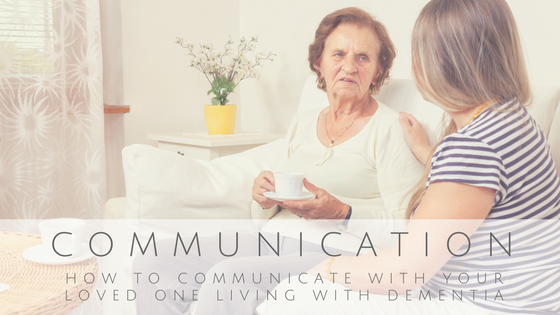 If you take care of someone living with dementia or Alzheimer’s, as the conditions worsens, you will most likely begin to notice that your loved one’s ability to participate in conversations, understand what is being said to them and communicate begins to deteriorate. As his or her ability to communicate clearly begins to decline, your loved one can become frustrated or angry. These signs and behaviors may be considered as “red flags” that your loved one has reached the moderate stage of their disease and you will need to change the way you interact with them because what you used to do may become increasingly frustrating and ineffective. There is an art to communicating with someone with moderate to severe dementia, especially a loved one. It’s not easy but it can be learned. Try thinking in terms of “triggers.” There are triggers you want to avoid and triggers you want to connect to, if possible. Don’t argue with them or correct their inaccuracies. It is okay to let misstatements go. Being corrected is frustrating for anyone, especially to someone dealing with dementia. Refrain from using “baby talk” with your loved one. A person living with dementia is still an adult and should be treated as such. Even with dementia they may pick up on condescension and become angry. Instead of speaking loudly, speak calmly, warmly, clearly and very intentionally. Speaking in a slightly lower tone may also help if someone has a hearing problem. Avoid talking over your loved one or as if he or she isn’t in the room. Instead, address your loved one directly. Tell your loved one who you are and call him or her by name. Use short, simple words and sentences. Use just one or two simple sentences at a time. Go somewhere quiet, free of distractions and use light touch to get and keep your loved one’s attention. Turn off the TV. Enter your loved one’s world because they can’t enter yours. Try to maintain eye contact. If the person begins to get upset because they can’t communicate something, reassure them that it’s okay and you are there. Do all you can to avoid them becoming frustrated. Along with telling your loved one, also show them. Use pictures as often as possible, especially when talking about the more distant past rather than the recent past. For more helpful information on communicating with your loved one, visit www.alz.org.